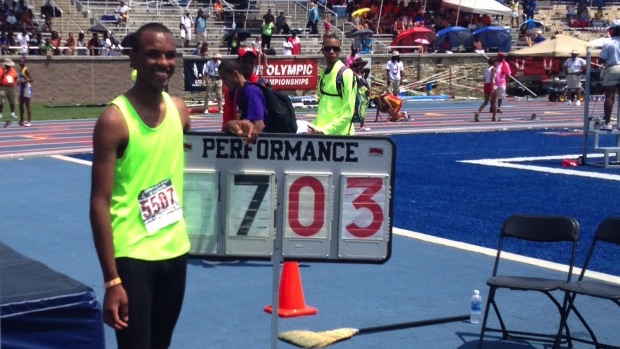 Summer Track Results: AAU National Junior Olympic Champs - Shawn Barber PV National Record! Shawn Barber (TX) won the pole vault with an amazing National Record of 18-03.50, just getting over Tommy Skippers 18-3 jump from 2003. Ryan Clark (GA) put out an impressive time for a frosh in the Intermediate 400m dash, winning in 46.89, #2 All-Time with only William Reed's 46.55 frosh record! Aaliyah Brown (IL) won the Young 100m dash with a time of 11.89. Cassondra Hall (GA) won the Intermediate 100m dash with a clocking of 11.76. Cameron Burrell (TX) won the Young 100m dash with a clocking of 10.59 while Xavier Atkins (FL) won the Intermediate 100m in 10.58. Kendall Baisden (MI) won the girls 400m dash with a blazing national record time of 52.74! Aldrich Bailey (TX) won the boys 400m dash with a super quick national record time of 45.45. Kendell Williams (GA) added to her gold medal haul by winning the high jump with a leap of 5-08. Daesha Rogers (FL) is looking phenomenal, winning the Sub-Youth 800m run with a national record clocking of 2:07.65, lopping 2 seconds off her own record set in the prelims on Monday. Charles Jones (MO) also set a national record in the 800m. Running in the Young division Jones cracked 1:50 with his clocking of 1:49.78 to dip just under the 1:49.8h clocked by John Marshall back in 1980. Ashlie Blake (NV) won the girls Intermediate shot with a monster put of 52-01. The mark is a national record, crushing her own mark of 49-00 from last year. Johnny Carter (CA) won the Young men's long jump with a fantastic national record leap of 25-06.50. Kendell Williams (GA) is looking strong with a win in the Young women's long jump of 20-06.75 for the win. Jazmine McCoy (MO) was 2nd, also with a great jump of 20-02.75. Williams also ran 13.62 in the prelims of the Young women's 100m Hurdles and then came back and won the final with a time of 13.68. Mikaela Smith (CA) won the Young women's 800m run with a time of 2:10.32. Terrell Jackson (TN) set a national record in the Youth 800m run with a clocking of 1:57.61. Randall Cunningham won the Intermediate high jump with a stellar leap of 7-02, taking down the record of 7-00 from 1986 by Johnnie Bartley. Johnny Carter (CA) won the Young men's triple jump with a huge leap of 52-00.25, setting the AAU national record in the process. Tommy Mccaplin was the fastest qualifier in the Young men's 100m dash with a time of 10.72. Ce'Aira Brown is the top qualifier out of the Young women's 800m prelims with a time of 2:14.71. Dontavius Wright was the fastest out of the Young men's 800m prelims with a time of 1:55.19. Dakarai Hightower soared to monster heights in the YM High Jump yesterday! Aaliyah Brown turned in a fine performance to take first in the YW 100m dash with a clocking of 11.56. Aldrich Bailey added to his 200m gold with his winning time of 10.44 in the finals of the YM 100m dash. Marcus Chambers won the YM 400m dash with a blazing time of 46.18 to win by nearly a second! Kendall Baisden won a thrilling YW 400m battle over Felicia Brown 53.90 to 53.97. Aliyah Abrams won the IG 400m dash with a swift clocking of 53.78. Dakarai Hightower won the YM high jump with a monster leap and PR of 7-03!! Kaley Ciluffo won the IG 800m run with a swift clocking of 2:10.34. Aldrich Bailey took the YM 200m dash over Marcus Chambers 20.78 to 21.06. Felicia Brown won a hotly contested YW 200m in 23.62 with Aaliyah Brown just back in 23.74. Brionna Thomas won the IG 200m dash with a time of 23.67. Charles Jones won the YM 800m run with a blazing time of 1:50.03. Dhiaa Dean won the YW 800m with a time of 2:12.38. Felix Obi won the YM triple jump with a leap of 49-08.50. Sarah Bell won the YW pole vault with a mark of 13-03. Nataliyah Friar won the YW triple jump with a fine mark of 40-09.75. Kendall Baisden was fastest through the YW 400m semis with a quick 53.37 clocking. Felicia Brown has the fastest YW 400m qualifier with a time of 54.98. Kendall Baisden had the 2nd fastest time in 55.17. Marcus Chambers had the fastest YM 400m qualifier in 46.88. Felicia Brown also had the fastest YW 200m qualifier in 24.22. Aldrich Bailey lit up the track in the YM 200m semis with a time of 20.82. Ryan Donnahoe won the YM shot with a put of 59-11.25. Tera Novy won the YW discus with a toss of 156-09. Aaliyah Brown (IL) was the fastest YW 100m qualifier with a time of 11.75. Aldrich Bailey (TX) was the fastest YM 100m qualifier with a time of 10.42. Christina Hillman won the YW Shot with a put of 53-10.25. Victoria Owers was 2nd with a mark of 47-05.75. Avana Story (GA) won the YW Hammer throw with a toss of 178-02. Charlie Ionata (RI) won the YM Hammer throw with a mark of 203-05. Rudy Winkler won the 16lb Hammer competition with a US#1 toss of 196-00.25.